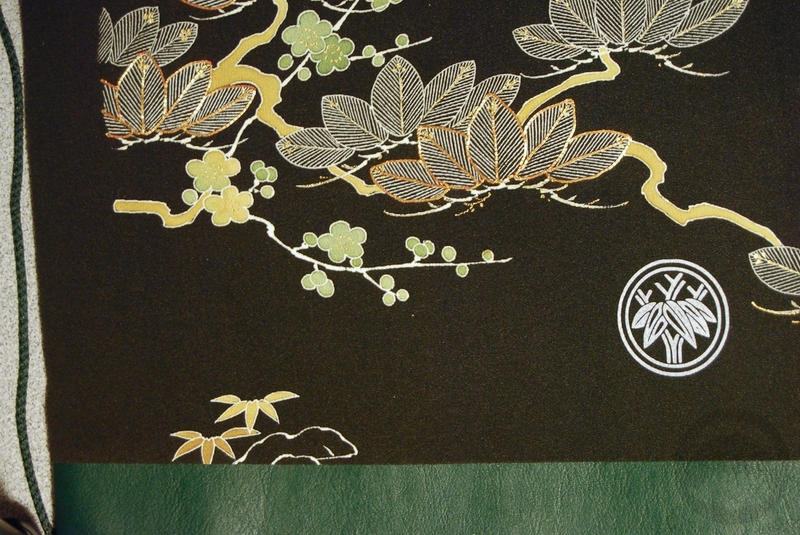 Home Catalogue Archive by category "Kanzashi and accessories"
I’ve been admiring the jewellery from Biku Designs for quite a while now. Owned and created in Tokyo by a lovely woman named Victoria Close, all the beautiful items are made using recycled kimono fabric and representing the values of mottainai. Between gift shopping during the holidays and making more practical purchases like tatoushi and arms for the mannequin I didn’t have much of a budget for pretty fun things. 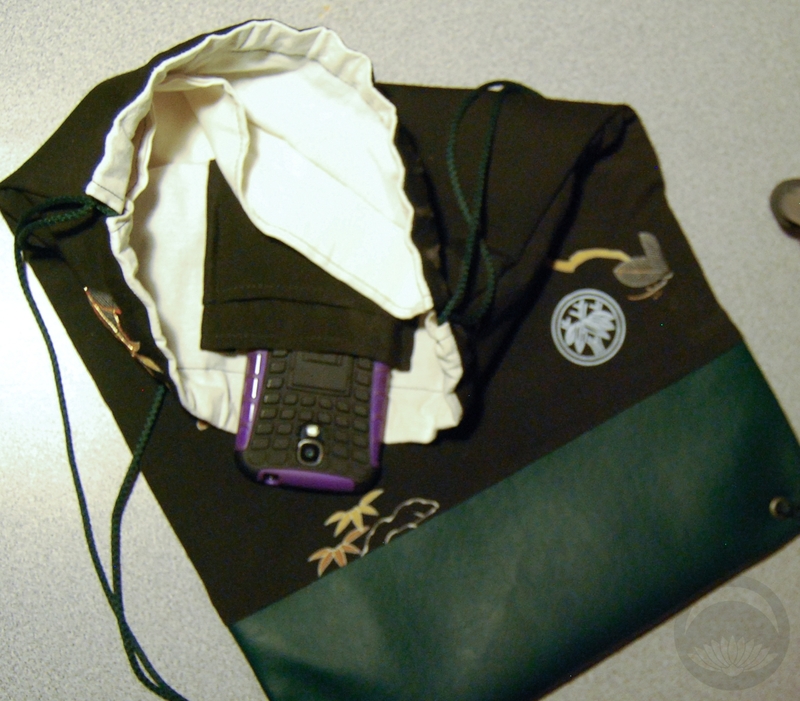 However, to celebrate the new year they released a fukurobuko (福袋), or lucky bag. This a tradition where vendors will offer a bag or bundle with a surprise selection of products available for a really steep discount. I snatched one up right away, knowing it would give me a lovely variety of items to wear and feature, and I’m so glad I did. 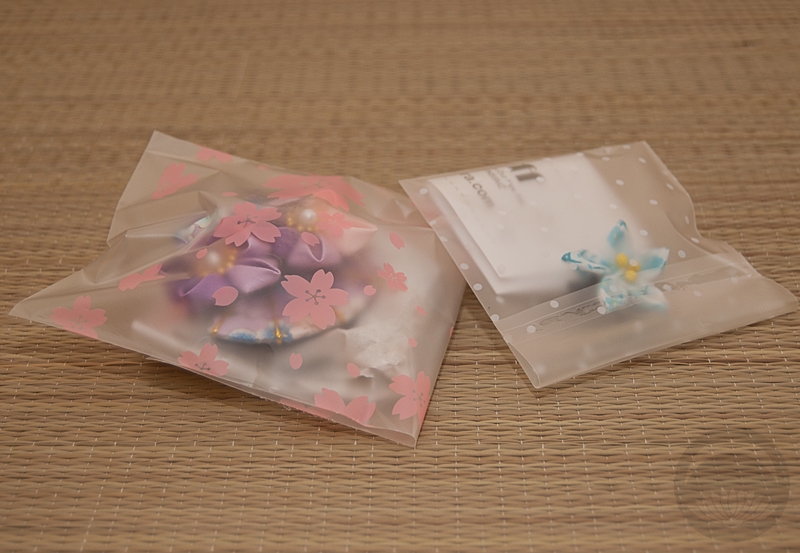 The items arrived well-packaged in a lovely little custom bag, emphasising the fukubukuro aspect of the bundle, which was a lovely touch. Each item inside was separately wrapped in red tissue, which made unwrapping it feel like a special event. I kind of wish I’d waited to open it so I could take better photos, but it arrived while I was at work and I was so excited and impatient I ended up tearing into it and only snapped a few photos on my phone. Today, though, I made sure to take better photos that really show off the beauty of each item. 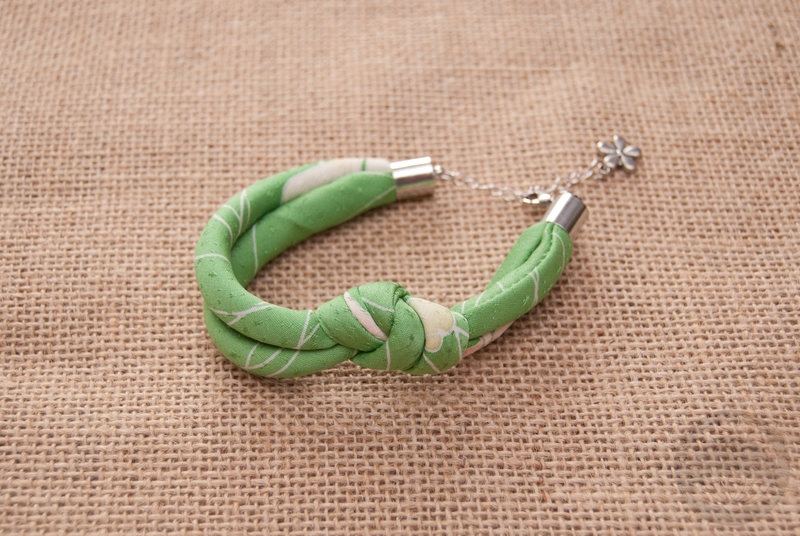 First was a beautiful fabric cuff, tied in a knot that reminds me of an obijime. I love that there’s a chain on this, because I’ve got very broad wrists and a lot of times bracelets are snug on me. Making this so adjustable is a very thoughtful finishing detail. 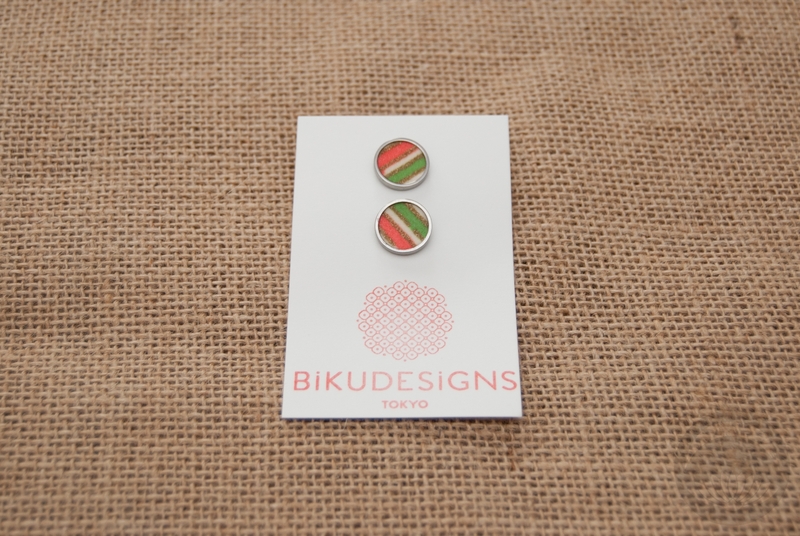 Next are a beautiful pair of stud earrings with embedded kimono fabric. You can tell Victoria put a lot of care and attention into these, as the patterns are perfectly balanced. I don’t typically wear stud earrings but they’re all my mother wears and I know she’ll love these, so I’m happy to give them to her. The third item is a brooch, and again the attention to detail is obvious. The underside is just as well-finished as the top is, and the pattern feels balanced. This will also work very well as an obidome, and I can’t wait to pair it with an outfit! 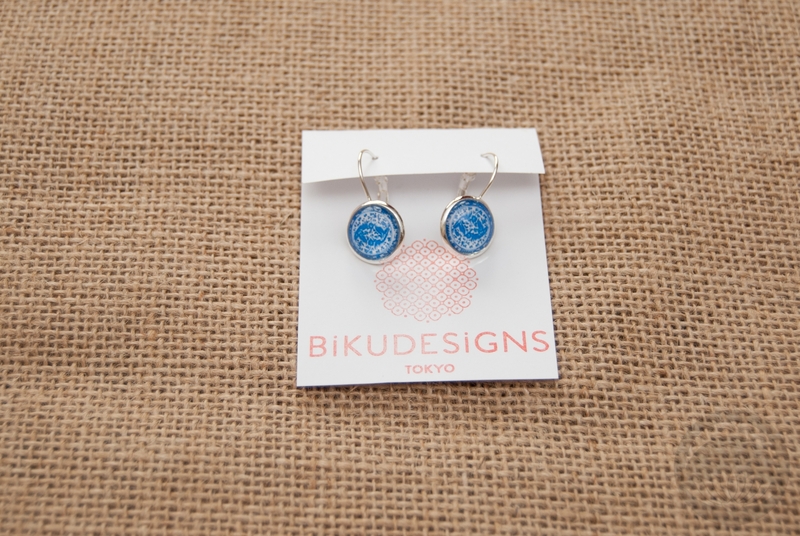 Last up are a pair of french wire earrings with blue and white fabric under resin cabochons. These are the sorts of earrings I love and wear quite frequently, and I know these will be a cherished part of my regular rotation. Every single item is clearly made with an abundance of care and attention. There’s not a single messy or unfinished edge to be seen, and everything feels delicate while remaining solid and wearable. 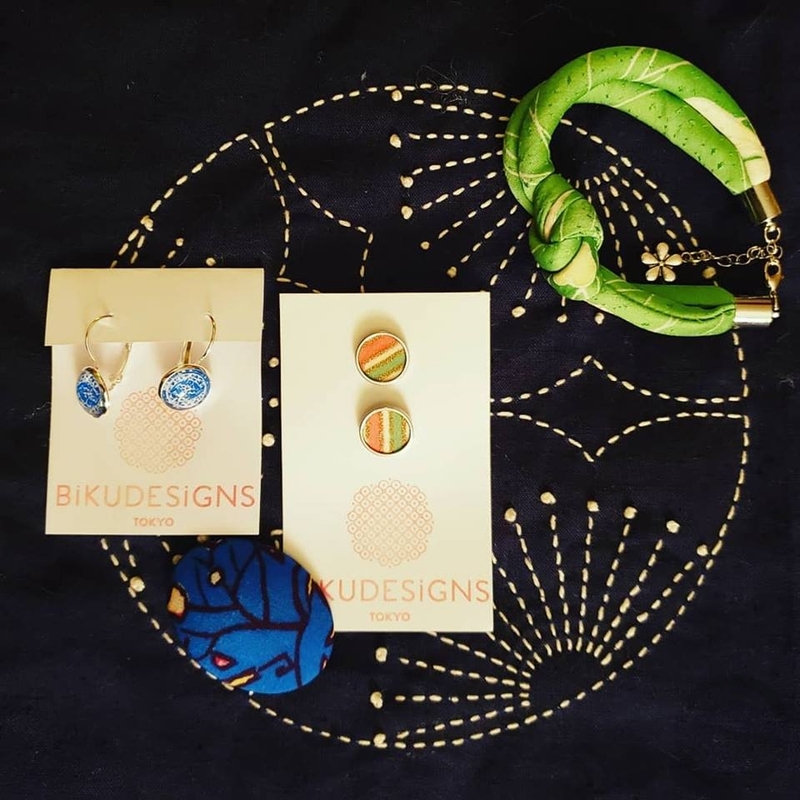 If you’re looking for accessories with a bit of wa flair to add to your everyday wardrobe, or a gift for someone who loves Japanese textiles, I definitely recommend checking out Biku Designs. 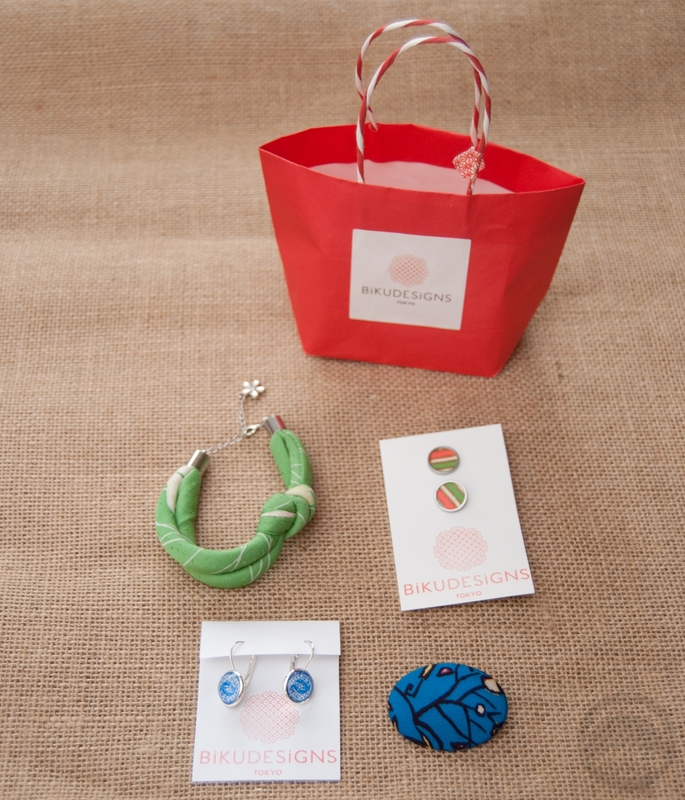 I love all the items included, and the colours feel very “me” – blues and greens, like my hair! I had been in contact with Victoria before, and included a link to this blog but I have no idea if she actually selected the items for each bag or if it was just a happy accident. Either way, I’m thrilled! 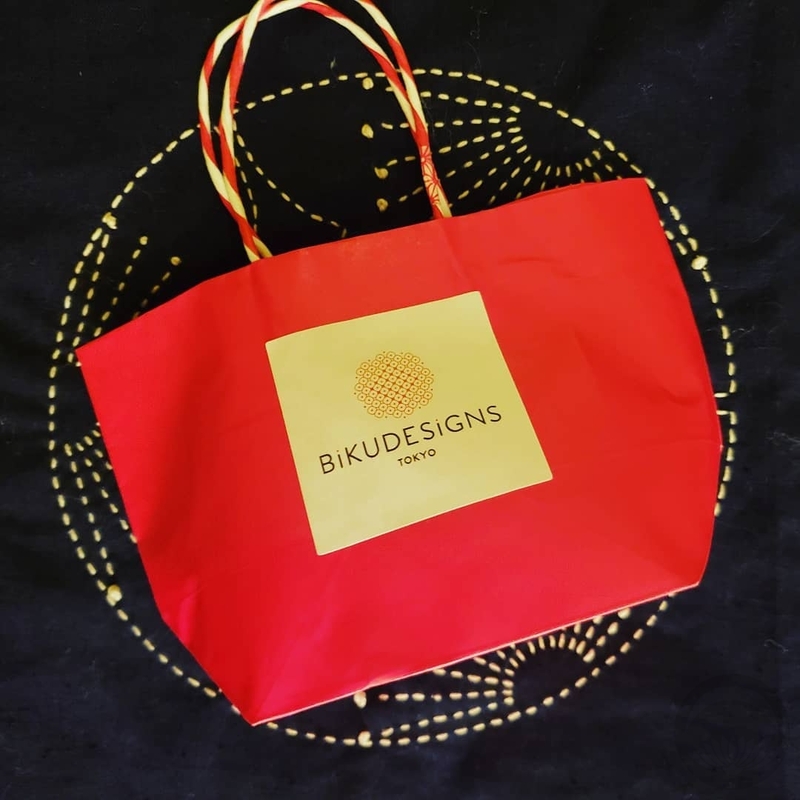 You can find Biku Designs on their website, facebook, instagram, and twitter. Unfortunately the lucky bags are sold out, but there will be plenty of new stock on the website in the near future. 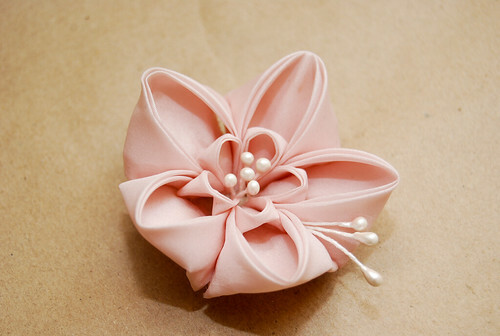 Modern Sakura is a fairly new US-based kanzashi brand. I’ve been following them on Instagram for a while now, and when I saw they had created a Kickstarter crowdfunding camp aign to get established, I knew I wanted to back them. 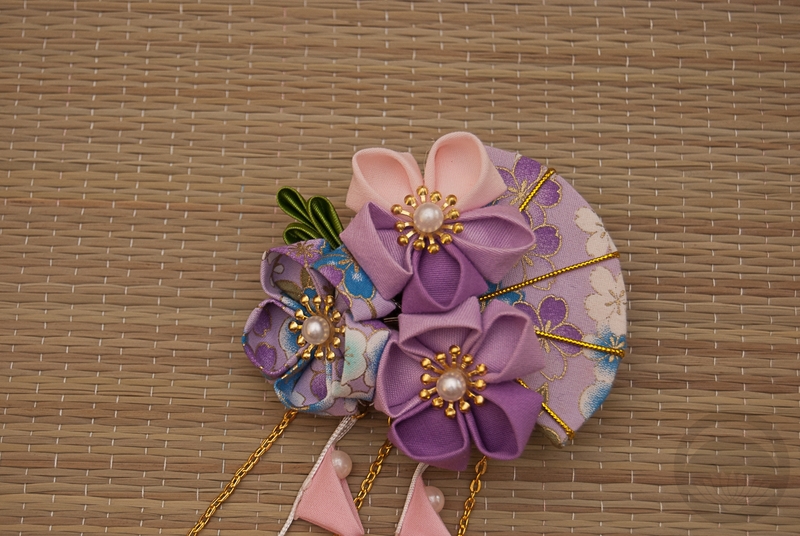 The campaign was understandably successful and I chose the purple and blue Summer Breeze kanzashi. I received mine yesterday, and I’m very impressed. The first thing I noticed was the custom mailer boxes. It’s a really nice little touch that makes receiving the product feel very special. 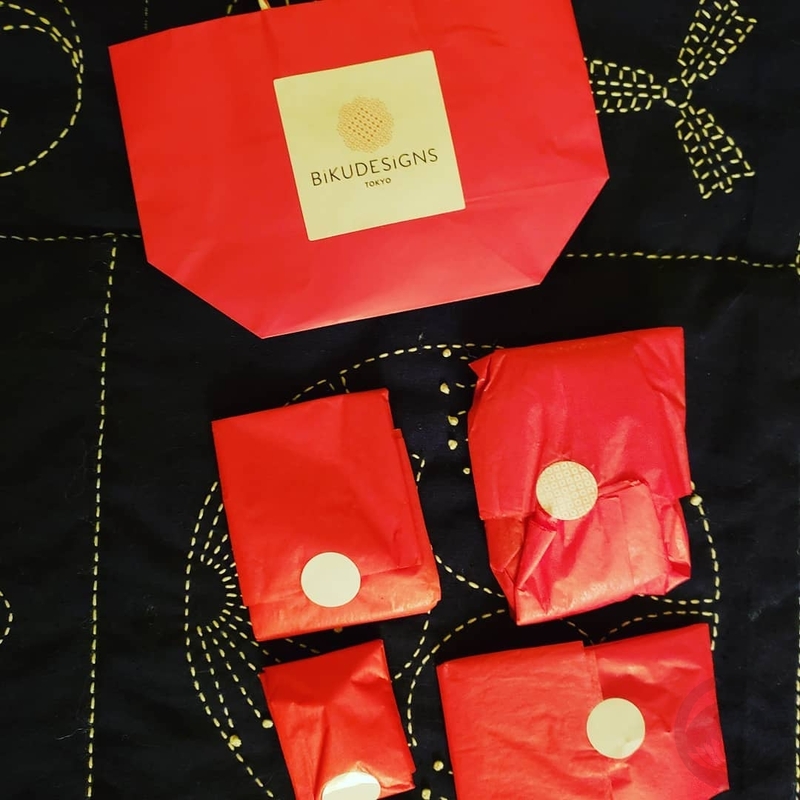 Inside the customised box was two adorable printed glassine bags, another sweet little detail that while entirely unnecessary adds a level of thoughtfulness to the finished product. There were two pieces in the box, which I was not expecting! 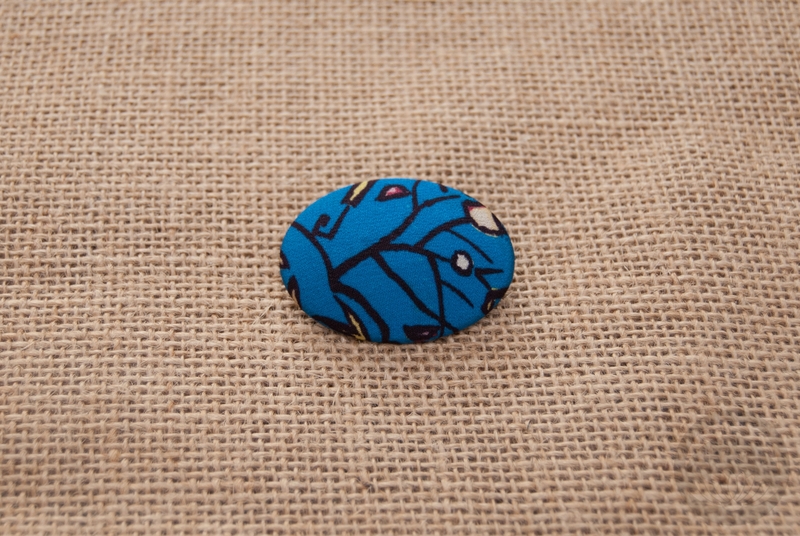 The tiny blue flower clip is so adorable and subtle, and will be great for everyday wear. As far as I know, these are exclusive to folks who backed the Kickstarter. 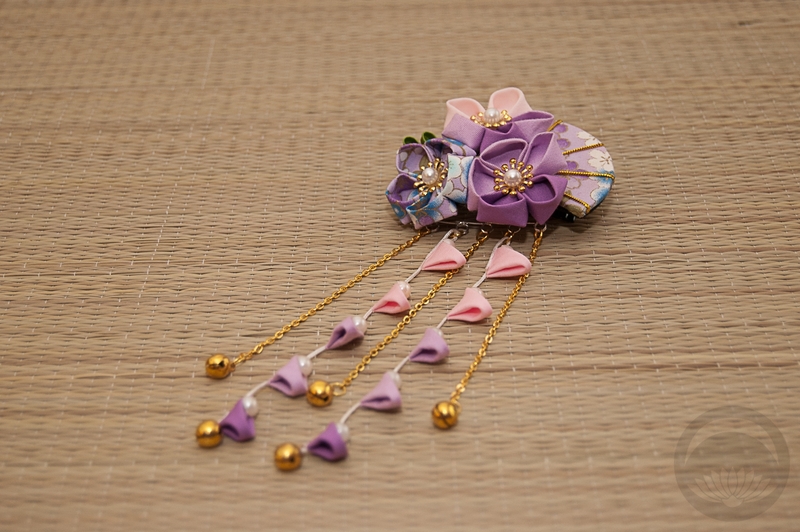 The pièce de résistance though was the Summer Breeze kanzashi. 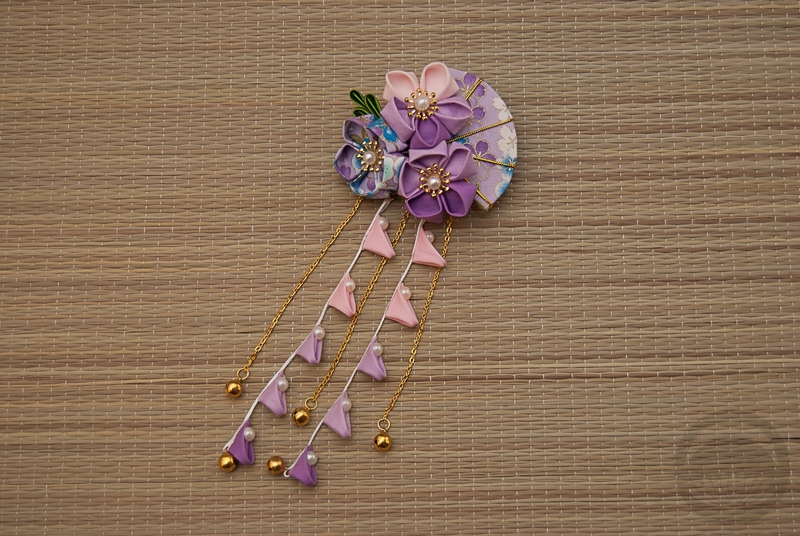 This piece has a unique combination of ume blossoms, a charming little fan, and flower and bell dangles. Admittedly, this style is quite juvenile for someone of my age, especially with the little bells, but when has that ever stopped me before? The piece is very well-finished, even the back is smoothly covered with fabric to ensure quality and durability. There is a small metal alligator clip on the back, which was an excellent choice in my opinion, as it tends to grip even fine hair like mine. 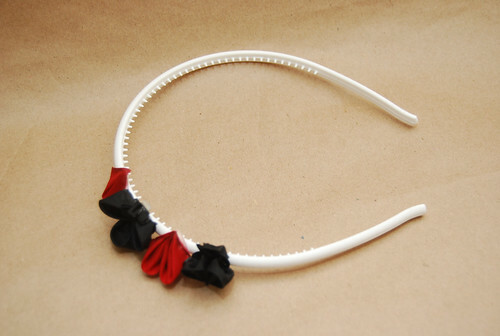 It also makes the piece suitable for a wide variety of hairstyles – kanzashi mounted on traditional wire pins are really only going to work with fairly voluminous updos but this style of clip means the piece can be worn on long, loose hair as well. 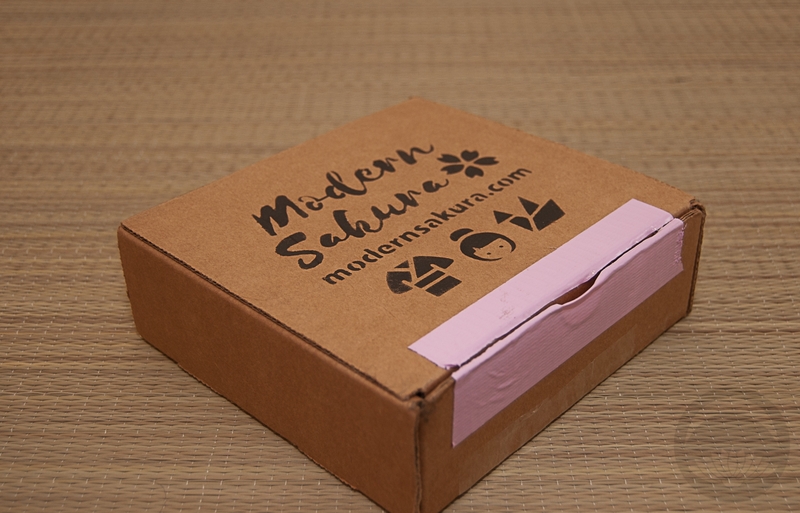 If this is a sign of things to come, I expect to see and hear a lot about Modern Sakura in the future. 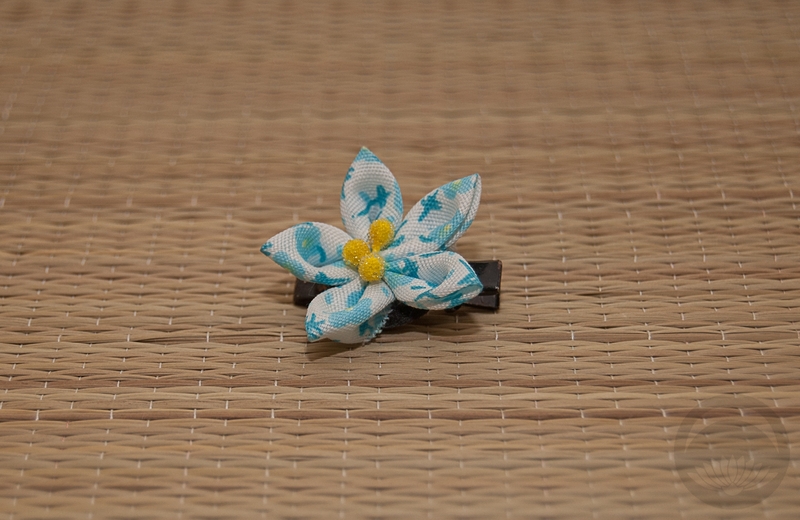 If you’re interested in some affordable, modern kanzashi that will work as well with kimono as they will with western-style clothing, check them out! 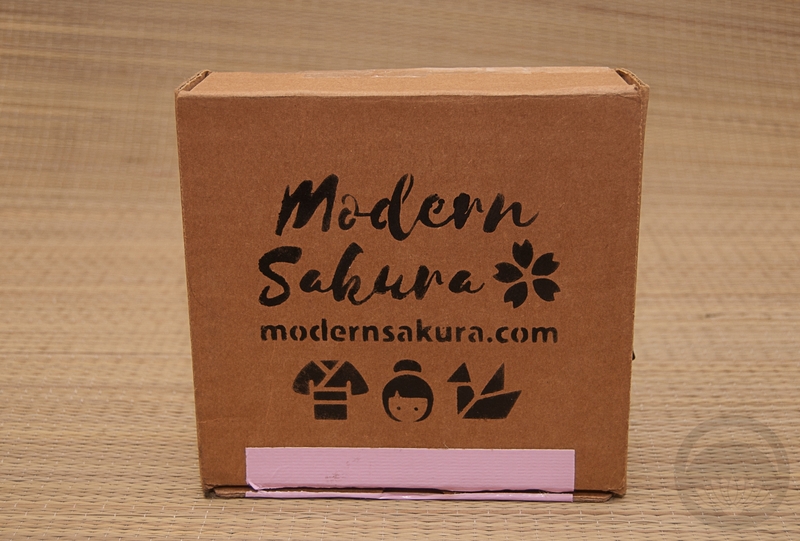 You can find Modern Sakura on their website, as well as their Facebook page and Instagram. Especially now that I can’t wear kimono on the regular, I’m always on the lookout for ways to inject a bit of wa, or essence of Japanese culture, into my regular wardrobe. 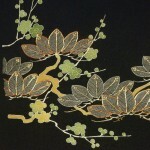 I’ll do things like wear haori over western clothing or buy items and accessories in Japanese textiles. 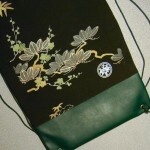 So when my friend Štěpán put up some backpacks he’d made with kimono fabric for sale, I jumped at the chance to own one. These bags are incredibly well-made. 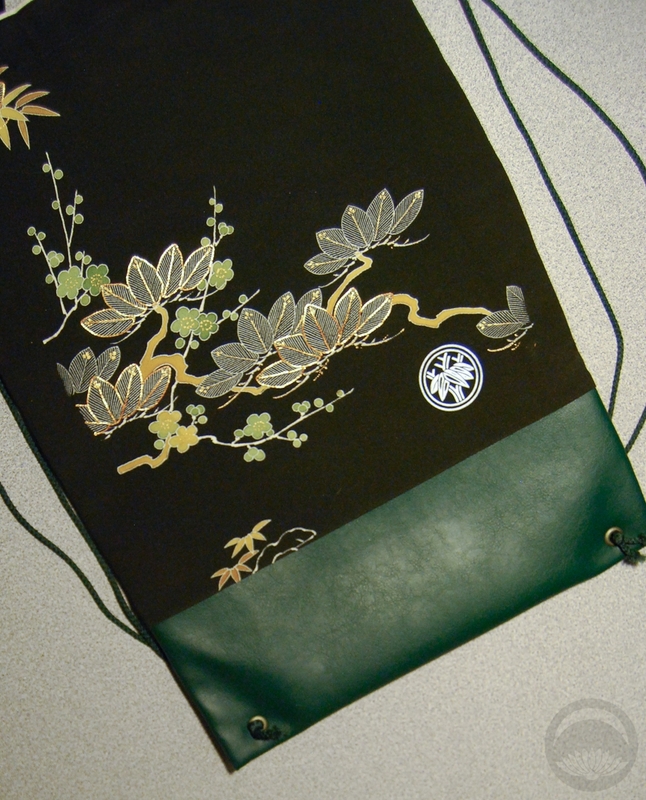 I’ve had similar backpack-style drawstring bags in the past (most notably a Sailormoon one that I carried until it quite literally fell apart on me one day), and I’ve never had one as nicely finished as this. Typically, they’re made from one layer of fabric and a string. However, due to the delicate nature of kimono silk, Štěpán has smartly chosen to both line his bags with a heavy twill fabric and reinforce the bottom with coordinating vinyl. 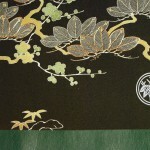 This means that the bags are very durable, putting almost no strain on the actual kimono fabric. The drawstrings are anchored through metal grommets that are inserted into the vinyl section, adding further stability and reinforcement. 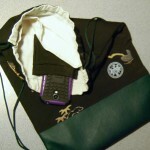 There is a divider inside the liner, splitting the bag into two very practical pockets. 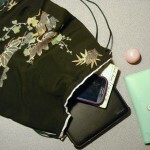 There are also two tiny pockets made from more kimono silk, and they’re perfect for carrying small, frequently-used items like a phone and keys, so you don’t need to go digging around in the bottom of the bag. 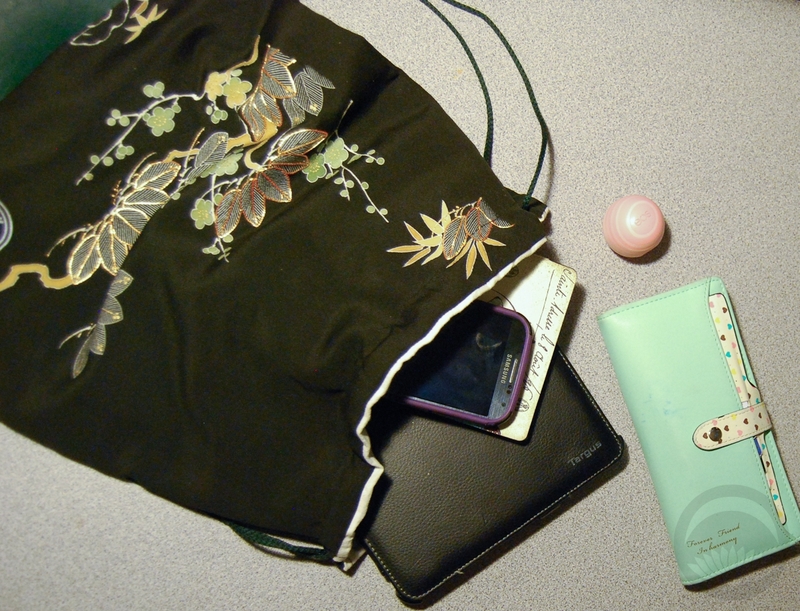 We’ve all missed a call or two because we couldn’t find a phone in the depths of an over-stuffed bag, right? 😉 I have been using this one for a week now, and while it’s definitely more of an “event” bag than an everyday bag, it absolutely holds up to modern life. I am hoping to buy more of these when I have the budget. Currently available bags can be found on Štěpán’s facebook page. I purchased this item myself and chose to review it. If you have a topically appropriate craft, product, or service you would like me to review, please contact me. Parasols are one of those things that look adorable with kimono and yukata, and are also very practical with western clothing, especially if you are as unlucky as I am to be as pale as bread soaked in milk, and ridiculously prone to heat stroke. 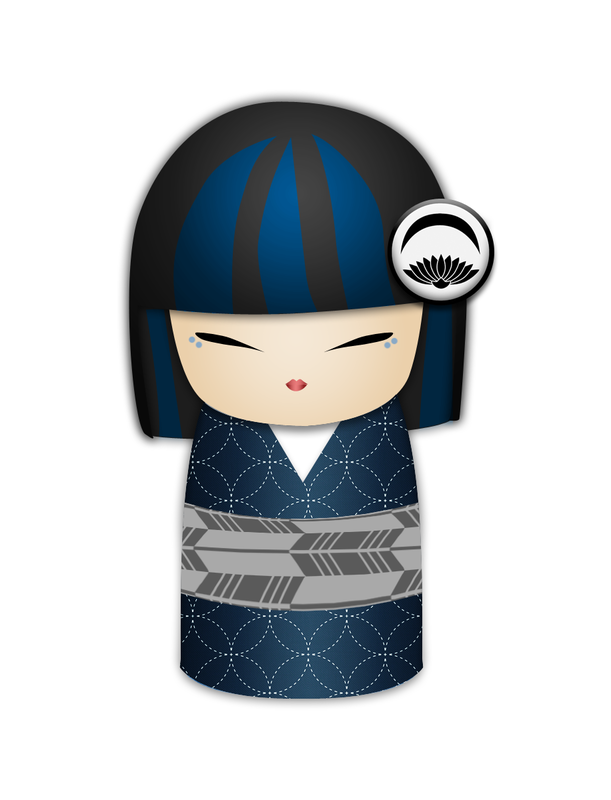 In fact, I’ve been doing a lot of catalogue-style entries lately because it is just too hot for me to get dressed in kimono! They’re great for taking a stroll to the park or attending outdoor festivals. Some of them can even help keep you dry in a light sprinkle of rain (though I would not suggest subjecting them to anything more severe than a drizzle). This is definitely my favourite parasol, and I found it at a children’s book store, of all the odd places! It’s red plasticized fabric, so it’s quite durable and can put up with a fair bit of abuse, and I really like the pattern. I hate goshoguruma, the typical Heian-style carts that carried people, but I’m pretty fond of hanaguruma, the flower-carrying carts. 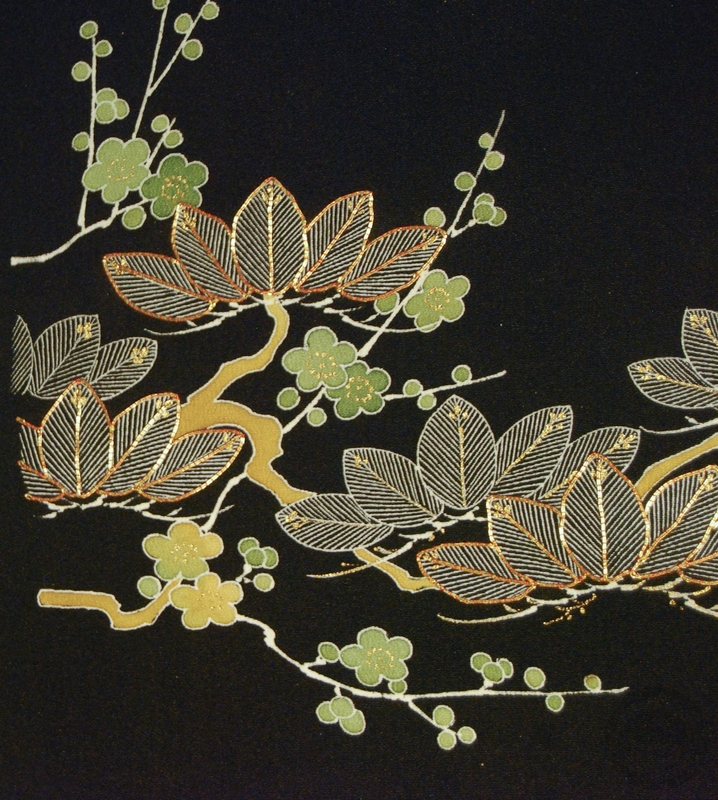 It looks like fabric you’d find on a furisode or something. I also really love how bright and fun it is. It’s actually a child’s parasol so it’s a little smaller in diameter than the next two, but it’s more than sufficient to shade my head and shoulders. I picked this up at a matsuri years back, and while it was most likely made in China for tourist export, I’m still quite fond of it. Dragons, when cheaply mass-produced, can tend to look a bit dopey, but this little guy is surprisingly intelligent-looking. This came from the same vendor as the previous one, and again, it’s nothing fancy but the pattern is cute and sweet, and it works well when I’m in the mood for something girly but subdued. I received these two gorgeous handmade hair accessories, or kanzashi, from Kornelia and I really encourage you to visit her Etsy shop. As I’ve said many times before, I am a sucker for card suit motifs. I cannot wait to wear this with my card suit geta, spade obidome and a haneri I haven’t shown off yet. This is adorable, and I have to say I have never seen card suit motifs done using this method before. It’s so charming! 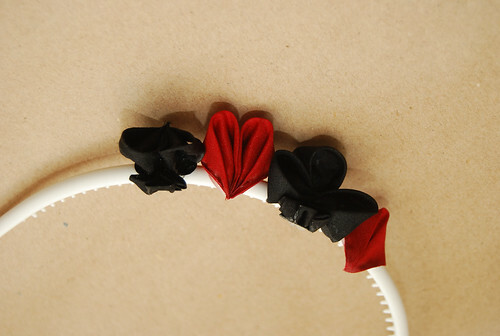 I also really love that it’s on a hairband, so I can wear it no matter how short my hair might be. 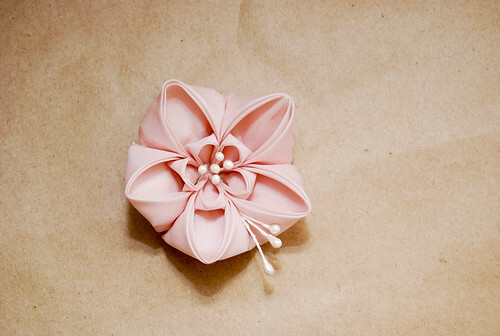 This is a much more traditional-looking kanzashi, but I don’t find it any less beautiful or charming. It’s such a delicate colour, but it’s a nice substantial size, so it doesn’t feel too twee or childish for someone of my age and height. The alligator clip needs a little more hair to grip than I currently have, but I’ll be growing it out a little bit again for the fall so I’ll be able to wear it during the winter, when it’s in season.